For a webcomic that’s only been up and running for seven months, Mare Internum manages to impress me even in its early stages. I came across this little gem on Twitter, another tell-tale sign of the great importance of social media in comics today. Der-shing Helmer, a freelance game artist by day, serves as the creator, writer, and artist of this webcomic, where she shows her creative mettle on all fronts. 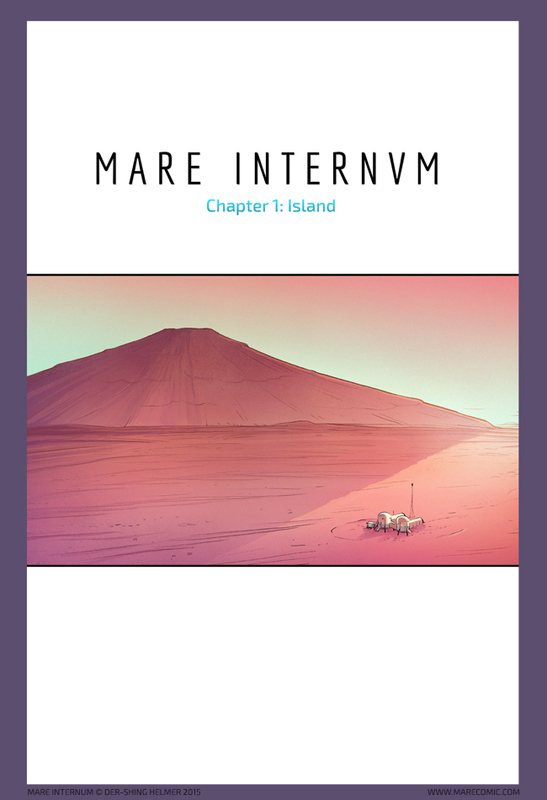 Mare Internum combines professional art, an inventive premise, and memorable characters to communicate a story worth reading. The story starts off on a grim note, with our anti-hero hero, Michael, attempting to end his own life. Thankfully, he doesn’t go through with it. Michael is a member of a team of scientists on Mars, apparently working on some kind of pre-colonization effort. His melancholy and ambivalence toward his boss is interrupted by the arrival a new coworker, Dr. Rebekah “Bex” Egunsola. The story slowly unfolds, revealing more about the world of Mare Internum, and explaining why Michael is in such a bad spot. Following the road not taken, we have a protagonist who has already hit rock bottom at the beginning of the story. But instead of showing him shrugging his way through it, Helmer instead shows us the consequences and logical results of someone trying to get through personal tragedy all by themselves. The truth is, those who don’t value the company of their fellow man are bound to fall into despair and loneliness. The comic hasn’t gotten far enough into the story to draw out the full ramifications of Michael’s bond with an A.I. he created, but I wouldn’t be surprised if things went that way. Aside from this particular innovation, Helmer writes her characters well, demonstrating that this isn’t just another science-fiction story insomuch as it is a character drama. Michael is melancholy and emotionally imbalanced. Bex is chipper and sardonic. Michael’s other coworkers each have their own personalities and quirks that make them unique and fun to watch. The cast of Mare Internum are all distinguishable from one another, each bringing something different to the table. Above all, the story puts the characters first, the mark of any truly great work of fiction. The natural, smooth dialogue only bolsters this element of the story. I especially like how Helmer patterns her art to tell the story in sync with the words. Comics, being primarily a visual medium, require imagery which catches the eye’s interest. Helmer does this expertly by focusing on the beauty of the mundane, such as Michael scarfing down a box of blueberries, or an insect floating on its back in a pool of water. She’s really good with facial expressions too, finding a middle ground between the exaggerated facial expressions of Manga-style comics and the more realistic depictions found in western comics. That’s all without mentioning her lovely art featuring the Martian landscape. As stated, Helmer is a freelance video game artist by day, but her background is in biology and education. According to her bio, this knowledge helps her with things like anatomy and physics. 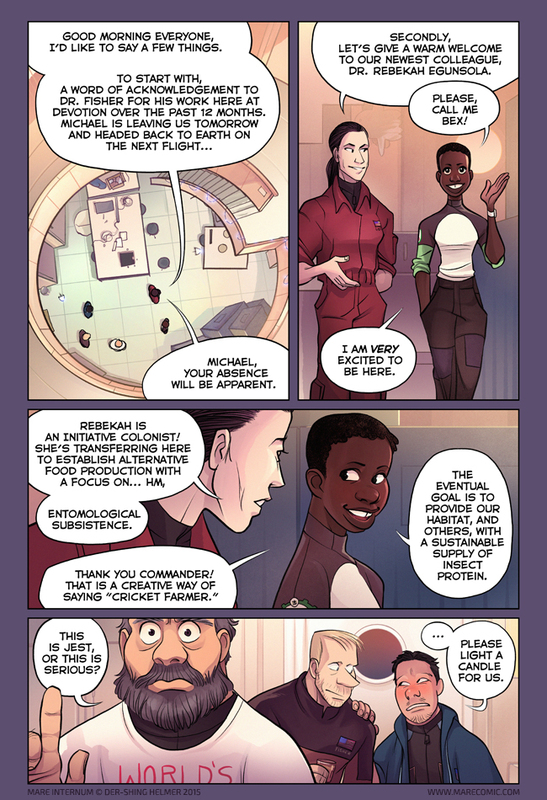 Following the philosophy of write-what-you-know, I would guess that an understanding of anatomy would help her when drawing characters, while an understanding of physics would help her in writing a sci-fi story like this webcomic. Mare Internum is still young, but I think it has the potential to grow a large following. Helmer also works on another, more long-running webcomic called The Meek, which I might take a look at some time in the future. As it is, Mare Internum has an abundance of good qualities, namely professional-looking art, innovating writing, and strong characters and emotion. A word to the wise, however: This webcomic may not be visually graphic, but it contains instances of incredibly strong language. Parents, be warned. 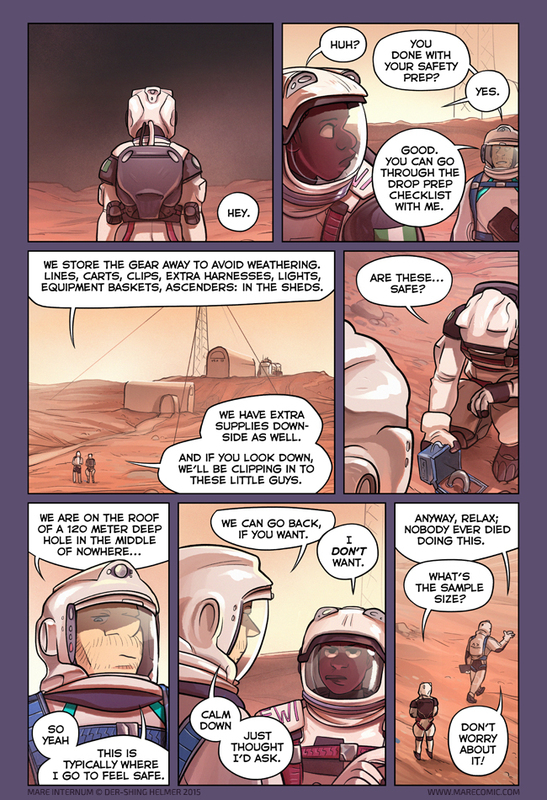 This entry was posted in Comic Books/Graphic Novels and tagged Levi Sweeney, Mare Internum, webcomic, Webcomic Wednesday on 07/15/2015 by primaryignition.